could recite chapter and verse of this classic. Three days ago, April 11, 2018, big problems in the Carter household. The furnace wouldn't go on and the temperature was dropping fast. The thermostat flashed: "lo [sic] battery". Here's the quick version of what happened next. Step One: Open fridge door. Because that, right beside the mustard, is where we keep our batteries. Step Two: Remove the plastic thermostat cover and lean in to read the battery-replacing instuctions, and in doing so, remove my glasses and hold them, as one does, between one's teeth. With the glasses hanging from my mouth like a furry gift dangling from Iris our cat, I removed the old batteries with my right hand and--this is important-- rather than place them on the counter like a real repair guy would do, I kept them in hand, clutching them with my baby finger. Of course one of them slipped and fell behind the one-metre-high shoe rack that sits below the thermostat and I decided then and there to reach down to fetch it. Almost pulled my shoulder out doing it. Plus I got a lot of lint on my hoodie. And it was at that moment--as I was bent over a shelf that has no reason for being there, finding not only a dead battery but also a pen, a crumpled-up Mastercard receipt and an Iris-created hair ball--that a question occurred to me, and that question was this: "Is 'klutz' a real word?" ROBESPIERRE BE HEADED FOR TROUBLE: Get it? I remember how happy I was several years ago when I learned that "schmozzle" is in fact Yiddish and means "chaos" or "mess". Before that, I thought it was a made-up word because it sounds exactly like what it means. I wondered if "klutz" was the same. I decided I would look it up as soon as I fixed the thermostat. Did I mention that I had placed the other old dead battery in one of the shoes on the rack, which is where--for safe keeping--I had put the new ones? Suddenly I had three identical AA Energizers in the lovely red high-heel and I thought, "Man these are nice shoes! I wonder which is the old battery and which are the new ones." You're thinking, "But the new batteries were cold to the touch, right?" And you'd be correct, except you've clearly forgotten my first paragraph. The entire joint was cold. So there was no way I could tell which batteries were which. I'm pretty sure it was my older brother Alex or perhaps my sister Charlene who I first heard say the word "klutz." Away back when. 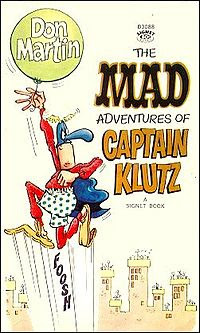 Funny thing, later, I Googled it and up came one of those flashes from the past: the book called The MAD Adventures of Captain Klutz, a staple in the Carter household john. Then I recalled Charlene--or Chuck, a name those of us who still love her use--calling ME, of all people, "Captain Klutz". Which reminded me again of another nickname, one that I still get, from Alex. If I'm at his house, he'll be walking to the kitchen and he'll ask, "Want a beer, Robes?" and by "Robes", he means "Pete." Here's why. One day, when I was 13 or 14, Alex perceived a link between me--his baby brother--and the French historical figure Maximilien Robespierre, who Wikipedia describes as "the repellent figure at the head of the Revolution who sent thousands of people to their death under the guillotine." 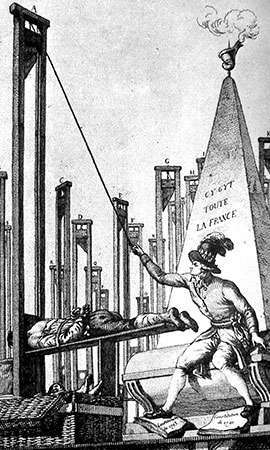 For some reason, in Alex's brain, I was Robespierre and, latterly, just Robes. (Could be worse. When I was an even littler kid, my older brothers and sisters called me, their beloved baby brother--and you'll have to ask them why--"Little Hitler." Actually, the more I think about my family and klutziness; I have a sense the condition is hereditary. Plus I think it has something to do with being easily distracted. But back to my furnace. I had the three batteries mixed up, but that's the story of my life, so give up is something I did not do. Rather, I shoved and jiggled and inserted and poked until the little lo-battery light disappeared and real LED numbers lit up. And then, I realized that my problem wan't just low batteries, the whatchamacallit sticking out the end of the battery wasn't reaching the piece of steel attached to the thermostat. The metal thingie was pushed in too far. I'm so proud of what I did next that the following day, I bragged about it to a bunch of other people, including a woman named April who works for the same company as me but in Georgia, USA., of all places and she's a novelist in her spare time--I scrunched up tinfoil, smooshed it between the new battery and the piece of steel, and the freaking thermostat started working again. The furnace came back on. My workaround was not sustainable. If I put the battery cover back on as is, it would dislodge the tinfoil and we would be out of heat again. So somebody in my house smarter and less klutzy than me suggested that as brilliant as my fix was, we could do worse than to summon an electrician to take a second look. 90 minutes later--thanks to my decidedly unklutzy method of finding hired help fast--a real licenced expert, with a pick-up truck, a t-shirt, muscles, tool belt, Spanish accent, the whole 8.22 metres--completed the job, just like that. I forgot to ask if he knew who Robespierre was.